The Kochbuch authored by Hélènemama (“Mother Helena”–the cookbook is dedicated to her daughter) was first published in Arad, Romania in 1920. A second edition was published in 1924. The cookbook is not a Jewish cookbook. 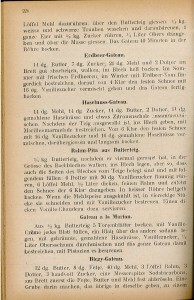 Rather, it is a cookbook in German language published in Romania. It ended up in our archives, as part of a collection of recipe books donated by a Jewish woman from Vienna, Hedi Levenback. This book was probably published in Romania for the German-speaking minority, which included many Jews. Arad itself had a German-speaking population that was substantial until the end of the Second World War (even today, a minute number of ethnic Germans still live in Arad). The cookbook does not appear to have any ethnic Romanian recipes or any other recipes from countries of the former Austro-Hungarian Empire. 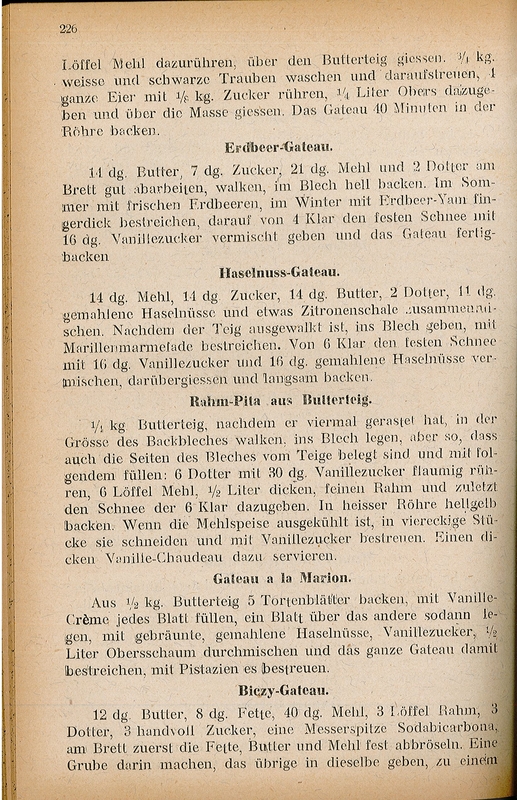 Any non-German or non-Austro-Hungarian recipes seem more fanciful items that are adopted for the German kitchen, such as “French Lamb,” “Brazilian Cake” or “Gnocchi Palmyra”. In countries in the former Austro-Hungarian Empire, food was often seen as a sign of identity. For example, Hungarian Goulash became a symbol for Hungarian separatists of a Hungarian nation independent of Austria, and subsequently Hungarian nationalism. One can guess that ethnic Romanian cookbooks contained very different recipes than this German-language cookbook does. Arad was a very Hungarian city prior to WWI (it borders Hungary today and geographically is considered part of the Great Hungarian plain-Alföld). The Romanian population in the area lived in the countryside, while the Hungarian and German population lived in Arad itself, so it would make sense in any case that Romanian recipes weren’t included. Romanian dishes might have been considered peasant food recipes, not included in cookbooks for the cosmopolitan city dweller. On the other hand, the book does include some Hungarian items. This cookbook, like many others in the Leo Baeck Institute, operates on the understanding that the cook already knows the basics. Directions can be sparse on measurements or cooking time. Some recipes begin: “Make loose yeast dough” or “add an amount of lemon juice” or other such sentences that, for the modern chef and baker, could make or break a recipe. The author also urges the cook to use a sense of poetry (“poesie”) with the recipes, as if things aren’t vague enough! But we need to remember the housewife or cook of the time were expected to know and understand the basics. Hedi Levenback escaped Austria in 1939 via a Kindertransport to England at the age of 14. Her own mother had died of natural causes when she was only six, and she was raised by an aunt. Her aunt managed to flee Austria as well, immigrating to Shanghai and, after the war, joining her niece in New York. We presume that this cookbook belonged to her aunt, carried with her from Vienna to China and to her new life in the United States. She seems to have been truly devoted to the domestic arts. The collection contains a large body of published cookbooks, but also handwritten recipes as well as needlepoint and sewing patterns which she also packed and brought with her into exile–reminders of a lost domestic home.